The merchant pay today (2015) between 1.2-5.0% to accept the most common card-brands in the world. MDR stands for Merchants Discount Rate, which is a fee imposed by the issuing banks to its merchants. Today the card-brands try to take credit for so called Cash-Back sceams, where they say that using this fantastic card you get 3% cash-back. Such sales-buss words is nothing else than the fee they charge the merchants who actually gives you as the cardholder, nothing else than a discount. In the ViA Model and being a ViA Merchant, ViA do NOT impose any MDR fee to the shops own customer. If a shop has issued a card to you and you go back to the same shop and use your ViA Card, ViA do not charge any MDR fee. If you take the same card and you go to another shop or another chain-brand, ViA will charge that shop only 0.50% in an MDR fee and 20% of such MDR Fee goes back to the shop who did issue the card to you. Part of our patented solutions which we now ate pleased to share with you, is our safe ViA POS Register, a 'normal' card acceptance device turned in to a tiny cashier register where normally 10 different device is turned into a simple two device solution, the EDC terminal or as we call them the ViA eBM device plus a barcode reader, complete all you need as a safe cashier register solution. FIRST IN THE WORLD a complete cashier register solution in one and the same safe device as a ViA POS Register. This is unique in the world to have a combined card acceptance device and a cashier register solution in the same unit. 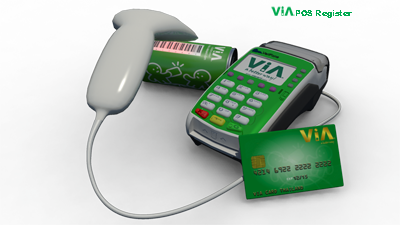 The ViA POS register is fully adopted to a cloud service where the shop can use the big companies solutions directly in the small shop or the small business. 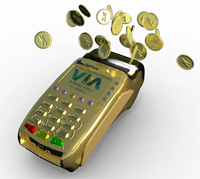 The ViA Card is the first pre-paid Cash Card in the world who offer 0% MDR FEE to the issuers own customers. The SPACE in the shop has a value, you agree? So it is also important to see how much and where in the shop you have the best earnings. ViA eBM devices is a better way on how to conduct proper business among small medium merchants. The shop-in-the-block, the street sales-person, the home delivery guy or girl actually any one who meet people and conduct some type of business.